Camp Season approaches and we fully intend to exceed our reputation in providing you with the camp experience you have come to expect from GPP Endurance. Not only will you have four awesome days of course and venue specific workouts, expert coaching, personal attention, tri-specific seminars and workshops, fully supported rides, awesome swag, and an incredible community of athletes and friends from all over the country, you have some surprises coming your way! This year we are pleased to welcome Breanne Nalder. She is an athlete and a self-proclaimed food advocate. 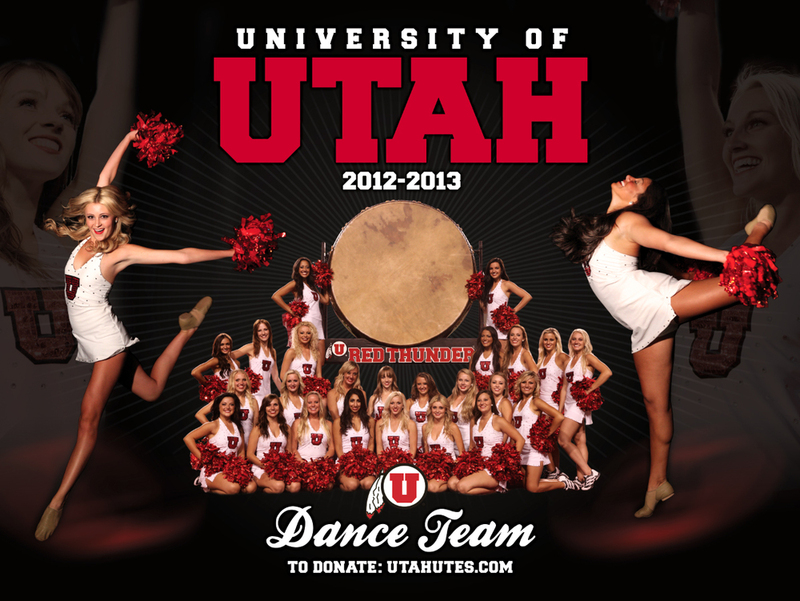 Breanne obtained a BS in Biology and a Masters degree in Nutrition and Sport Dietetics from the University of Utah. She began racing on the Ski Utah Cycling Team and now races for the K4-DNA Cycling women’s pro-development team. Breanne's job and passion in life is to teach how the food and nutrients we use as fuel drive our physical performance to be the strongest, fastest, healthiest athletes possible. Breanne has taken her boards and will soon be a Registered Dietician. She will be giving each of our registered athletes a nutritional questionnaire to fill out before camp. After which she will set up personalized nutritional profiles, at no cost to you. She will be available for consultations and will also give a workshop on specific nutrition periodization. We are thrilled to have her as a new member of our team! Tucson is the winter triathlon training capitol of the world! February will be the perfect time to train along the Gates Pass trail among the hundreds and hundreds of cactus! Meet athletes from all over the world, and climb Mount Lemmon! This year we have medals for all the athletes that conquer the summit! We will be staying at the Fairfield Inn and Suites in Oro Valley. To see more on the hotel visit www.fairfieldinn.com/tusor. Once registered for camp, you will receive the code for the group discount on your stay. This year we have made the St. George Camp specific to the inaugural St. George 70.3. We will train on the 70.3 course, with 70.3 specific workouts, and prepare you completely for May 12! We will be swimming at the Washington Recreation Center, riding through Snow Canyon, and running on the actual race course. Our host hotel, for the St. George camp, is The TownePlace Suites. Check it out at www.marriott.com/guts Rooms must be booked by February 13, 2013 to receive the discounted group rate. Wes and I have been preparing all year for you. We hope to continually take our camps to the next level so you are always challenged and we can help you reach your goals. Please know we are here for you and are happy to answer any questions you might have. WIN 1/2 OFF REGISTRATION FOR YOU AND A FRIEND! One week left to save $100 off registration to come train with us in the Winter Triathlon Training Camp of the world! February 15-18, 2013 is a weekend full of exceptional triathlon training among athletes from all over the world. Get expert coaching in swimming, biking, and running as we train in all three disciplines throughout just four days at camp. We will ride through Gates Pass, conquer Mt. Lemmon, practice run form and technique, meet one-on-one with a Registered Dietician, run the trails of West Tucson, and enjoy the community of incredible friends. Every training session is specifically planned based on the questionaires of the registered athletes. We want all our athletes to get attention, especially in the pool. So we invite several experienced guest coaches to come help with the swim sessions. All of our bike rides are fully supported by several support vans stocked with food, water, and supplies. Every age and ability of athlete have been welcome and have excelled at camp. We have been lucky to meet some of the best people and athletes around. These camps have a return rate of over 90%. For this week only, when you share this post on Facebook, you will be entered into a drawing to win 1/2 off your registration for the Tucson Triathlon Camp. Not only 1/2 off for you, but 1/2 of registration for one of your friends too! We want you to share this will everyone! The winner will be randomly selected and announced Saturday morning, December 8th! What an incredible and powerful event we were all lucky enough to be apart of! i am still getting donations and registrations so it will be a few more days before I have the total numbers of participants. I will let you know as soon as I can! To all the brave and giving people that supported The Burpee Mile, what a crazy thing to do. The amount of time, alone, in burpee-ing a mile is the same amount of time it takes some people to complete a 10k or 1/2 marathon. Some people can bike a good 30-40 miles or trail run up to Elephant Rock and back. In that same amount of time, on a motivated Saturday, I can edge, mow, and fertiluze my lawn...probably weed my flower beds. Without hardly any notice AND paying for it, you decided to put yourselves through a mile of the most hated movement we ever throw at you.The soreness, grass stains, hives, scraped knees and ripped up palms could have easily been avoided by just writing a check, true. And that's what NMV needs most, is the money to help those children find safety, guidance, support, and strength to heal from the layers of damaging abuse they suffered. Abuse from people who inflicted this abuse willingly and repeatedly to these helpless children. NMV uses this money to pay the therapists, for the programs, and for safe places for these victimized children. And donations, even small amounts, go a long way. Money is only part of the need. NMV needs brave people to lend a voice to the ones who can't speak about it. Whether it is because the victims think its their fault, whether they're embarrassed, maybe it's because it might get someone they really care about in trouble. This is a topic that we don't talk about because it makes other people uncomfortable, it isn't a topic that anyone wants to think about or address. But one victim lead to another. It is a silence that is loudly banging against the shut doors around us. Based on all the statistics in Utah alone, we ALL either know someone that has been sexually abused as a child, by someone they knew, or we have been victims ourselves. To everyone that supported The Burpee Mile, in ANY WAY, you opened your mouth and lent a voice to the speechless, spoke the taboo, stood up for the beat down, sacrificed your time, sweat, skin. Thank you. A Mile of Burpees is a crazy thing to do. So very many of you did it! Alone or with your families. In OK, FL, WY, CO, MI, Canada, TX, with perfect strangers. On behalf of No More Victims, the many generous and suportive Sponsors, the families of victims, the victimized children, as a victim myself, thank you for speaking up and doing something hard. Because there are things so much worse and much more painful than a mile of burpees. One day I hope and pray the cycle will end and these children will be victims no more. direction. Thank you for uniting with us in using our fitness to serve others. All proceeds will go to No More Victims. A local organization that helps children who have been sexually abused. This is a group event, a group effort. We start together, we end together, we do BURPEES for 1 entire mile. Why? Because it's tough, because a mile is a long way, and because 1/2 a mile has already been done. Despite what gym we go to, what health and fitness method we choose to be passionate about, WE ALL DO BURPEES. And we all agree that our fitness should be used to help others. We find strength in our community and power in positive change. We thrive in challenge and exult in the triumph of our achievement and the knowledge gained through temporary failure. We lift weights so that we can enjoy life and seek out ways to experience it. This will hurt. You will get dirty. You might want to quit. There will be someone on the right of you that will feel the same way. And the person to your left will be looking at you to see what you will do next. So you slam another one down, someone has to. Be unafraid. We can all do this together. The Burpee Mile. All ages, all abilities welcome! Friends, Families, Neighbors! We are honored to host gyms from all over the valley at this event. Don't miss out. For more information, if you would like to get your logo on the t-shirt, donate to No More Victims, or if you would like more information on how to sponsor this event, please contact Lizz HERE. Congratulations Brian! From completing Ironman Couer d'Alene in June to Boston Qualifier in September! We are so proud of you! Up above Snowbasin the smokey 'X' to mark the 2012 Xterra National Championships. Saturday athletes from all over the world raced one of the hardest off-road courses in the country. The long course National Champions swam just under a mile in Pineview Resevior then mountain biked 18 miles, climbing 4,000 vertical feet to Snowbasin. Coming out of T2 they immediatly hit a steep, dirt trail climb for the 10k run. The Xterra Utah Sport course consisted of a 750m swim in Pineview, a 19k (about 12 miles) mountain bike ride, and a 5k. GPP'er Kevin Mortensen showed up on Saturday to race the sprint and he raced hard and finished strong! Way to go Mort! Let's be clear, cookies are something that no person should ever have to live without. Cookies are also something that we don't have to eat every single day. Oh, but when the weather turns to fall, and the tempurature drops, I break out the Autumn decor and HAVE to start baking. Really the few options left to me are to just go without treats, buy expensive dairy free/gluten free/nut free/corn free/ cardboard imitation cookies, or learn to bake what I want. I mean give a girl a gluten free cookie she's happy for two minutes. But teach a girl how to bake gluten free and she is happy for a lifetime. I dawned on me that I work really hard at eating right and exercising, so if I am going to treat myself to something, I want it to be worth it and as uncardboard like as possible. Today for Sunday dinner we made orange chicken and I thought it would be cool to try making our own fortune cookies. I looked up the easiest recipe I could find and got started. Jordan promptly began to write out fortunes. "You will have dessert". "You will marry Justin Beiber", "This is paper" are just a couple of his ideas. They took forever! And I couldn't eat them! So I decided to that today was a good day to teach myself how to bake gluten free. Or just start anyway. I didn't want to run to the store so I gathered what I had and found a recipe for GF snickerdoodles. I adapted it from eatthelove.blogspot.com to make it work with what I had. I cut the recipe in half, nixed the shortening, and used the GF flour mix I had in my cupboard. Place on a greased cookie sheet, (I used a baking stone), about 2 inches apart and bake for 10-12 minutes. Take directly off the cookie sheet and place on a cooking rack. This recipe makes 3 dozen soft and (I think) worth-my-time-and-calories-cookies. **Worth noting. I asked Matt to try one because I was so thrilled with myself. He said, "Well...they are pretty good, kind of grainy." Then a long pause. "I guess if it's all you could eat they are fine." I thought they were yummy! 1 mile run. 10 minutes of dynamic drills/stretches. 10 minutes of strides. Complete the following on a track. Alternate direction, on the track, 1/2 way through the workout. GPP'ers Kim and Brian Robbins (left) and Kim's brother Matt (right) ready for Ironman! Ironman Coeur d'Alene Sunday will have several lime green athletes on the course all yelling out to eachother encouraging phrases that no one else will understand, but will give exactly the right umph to the one with "Sweeet" printed on their back. Over the last year Kim, Brian, and Kim's brothers (the Hardy boys) Matt, James and Scott have trained for together for this race. James wife Carmen and Scott's wife, Kelly have come to triathlon camps, open water swims, and all day rides to offer support and even train with them! This has been a family affair from the start, for the Robbins, Hardy's, and the rest of the tri family competing on Sunday. Wes and Jen Johnson (Wen), Chris Eaves (Sweater Legs), Tom Fletcher (Dr. Tom), Kathryn (Hacksaw) Throolin, Barbara Nelson, Molly Nelson, and Gretchen Margetts, all of whom will be sporting the bright jerseys designed especially for IMCDA. I'll post more pictures of the race and all the athletes (they will be easy to spot). Go get em guys. You have already made us so proud. Training for a race isn't like cramming for a test. Waiting until the last minute means squeezing every bit of effort into the last remaining hours before the gun goes off, hoping that somehow it will make enough of a difference, in your lacking physical fitness, to prepare you for 24 hours, no sleep, 3 running legs of varying length and difficulty, and 200 miles split between 11 of your friends. Or...they were your friends until you decided to NOT train until the three days leading up to the race where you thought you could run two-a-days on the mountain and make up for the months you procrastinated. To show up to Ragnar on Friday morning tired and sore will not a return invitation guarantee. So what should you do between now and Friday? What will help your race? What will make it so that your friends/co-workers/11 other distant semi-related-never-met-before-relatives ask you back for their team next year? Well you could show up with extra head lamps,reflective vests, and giant Coscto bags of swedish fish. Or, you could do something better, easier, and less expensive. Rest. In the 7-10 days leading up to a big race there isn't anything you can do to improve upon your physical performance that won't take away from your race. Within that time period the one thing that can hurt your performance would be to do too much. A workout that is too heavy, too intense, or too long would directly require more recovery and risk injury. The same with energy spent away from training. The taper is not the time to embark on huge home improvement projects or schedule a big business trip. However it is a great time to go for walks with the kids, out to dinner with the wife, and de-clutter your office space. As far as exercise goes, by the last week of your taper your workouts should be down to 25% duration and intensity. This is the week where rest and recovery rule. Nutrition shouldn't change except that you aren't eating the caloric volume you were when you were training several hours a day. Keep your intake clean with most of your foods coming from veggies, and lean meats then fruits and grains sparingly. Lay low on the fiber a few days leading up to the race and continue to drink your 64 ounces of water. With Ragnar your running mileage is broken up and your van is supporting you with fuel along the way so carbing up the night before isn't vital. As a GPP'er that has consistently trained 5x a week for several months, you are more than prepared for Ragnar. So if your running mileage hasn't been what other runners' has you needn't worry. Being physically fit isn't just about running in one direction, at one pace for miles and miles. The Ragnar race is a perfect example of how anything can happen...and probably will. GPP'ers are up for anything. You are physically ready for this challenge and will surprise yourself this weekend by what you are able to achieve....that is if you don't do too much cramming the next two days. 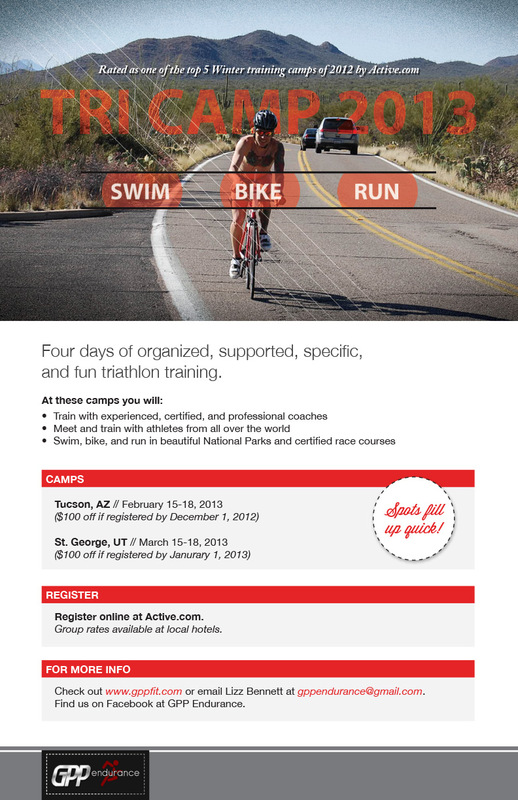 Thank you for registering for the GPP St. George Winter Triathlon Training Camp! As you are preparing for the camp be sure to check our website for updates. You can see us at www.gppfit.com. To get you started with your preparations here is a list of items we ask you to come prepared with for camp. Some of the items are weather dependent. The average high, in March is 68 and the low is 34, so be prepared for every kind of weather. Bike Trainer: We will use them if the weather is too bad to ride safely outside. Participants will be responsible for all meals and transportation to and from the venues but carpooling is highly advocated, plus it’s more fun that way! This year we have Dr. Tom Fletcher who will be doing a workshop on common triathlon injuries, prevention, and treatment. He will also be available to do ART (active release therapy) during camp, at specifically scheduled opportunities. He is blocking out 15 minute sessions at $20. We will let you know when he will be available so you can schedule with him. He is one of the best and we are lucky to have him! Lots of information! Again if you have any questions please contact Wes or I anytime! We are so excited to see and train with you all in just one month! Registration is still open for our Vegas camp! Thanks again and we look forward to seeing you very soon! This speed workout is great for building speed endurance, remember to scale back if you are just beginning these types of workouts. This workout is specific for NON HILL speed work, don't worry, those will be coming shortly. Right now this is specific for getting fast! 8 X 400m sprints with 100m (1:30) walks between each one for recovery. Each 400m should be performed at 90% effort. 4 x 200m sprints with 100m walks between each sprint. Each 200m should be performed at 100% effort. Keep track of your times and pace. Can you maintain your fastest sprint for each interval? A tempo training basic, more valuable than almost any other tempo workout, is the mile repeat. Make sure you are warmed up well with a short jog and drill work before starting your repeats. The following is an advanced workout. Remember to modify based on your training and upcoming goals. If on a track, change direction every mile. If on a treadmill keep incline at a minimum of 1%. If running outside, repeat the same mile to have an accurate comparison of effort and time. Keep track of your times for each mile. Modify this sprint workout based on how long you have been building your base, injuries, and ability. If you have just started running, only do the sprints 3-4 times. If you are just beginning your speedwork, only do the sprints 6-8 times. Advanced runners can complete the 10-15 sprints. Warm up with 1 mile easy then complete 15 X 100m all out sprints followed immediatly by 2:00 recovery jogs. After warm up sprint 100m all out effort followed immediatly by a 2:00 recovery jog. Repeat. Cool down with 1/2 mile easy. If you are doing this on the treadmill, make sure you keep the incline at a minimum of 1%. And only start "counting" your sprint when treadmill is up to YOUR max speed. We are thrilled to announce our Winter Triathlon Training Camp schedule for 2012! Last year was memorable as we met athletes from all over the U.S., trained on Ironman and 2011 World courses, and as we dealt with snow, rain, and wind. After the cold of St. George and the wind in Henderson, we all felt like we could handle anything…and that proved to be true throughout the remainder of the 2011 season! We formed lasting friendships that have been a huge support for all of us through the ups and downs of this year. Not only have all of us reached our goals for 2011, we did it together. From the St. George Ironman, to Boise ½ Ironman, Arizona Ironman, Cozumel Ironman, to the 2011 World Championship, to several podium finishes, we all reached a new level of achievement through our hard work, dedication, experience at camp, and amazing friends that are some of the most positive, fun, and solid humans on earth. This year we are thrilled to add a new camp! Tucson, the winter triathlon training capitol of the world! It’s beautiful, warm, and packed with venues to train on! The Tucson camp will be February 17-20. The St. George Camp will be held on March 16-19. The Henderson/Vegas camp will be April 6-9. At each of our camps we will have vehicle support for all the rides and runs as well as an experienced bike mechanic for any issues that might come up. As always we will have fuel, food, water, HEED, Gatorade, and first aid. This year we are lucky and excited to have Dr. Tom Fletcher attending all three camps. Dr. Tom has been working with Active Release Technique (ART) and Ironman for 5 years now. He has been part of the medical staff at Ironman St. George, Arizona, Coeur d’ Alene, Vineman, and KONA. He is an experienced athlete and good friend. He will be available to work on the athletes, at each camp, and he will be a guest speaker on injury prevention. 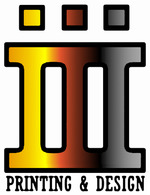 In Tucson we will have, returning guest coaches, Chip Beard and Shawn Wierick of T3 Training Systems. They are offering Lactate Threshold Testing and Run Technique Video Analysis to all the registered athletes at a discounted price. For more information about this testing, prices, availability, and contact information, please check out our website for more information and for links to the active registration pages. The earlier you register the more $ you can save. We also have hotels booked, at each camp, at a discounted rate. Wes and I know this will be the best Winter Tri Camp year yet and look forward to seeing all of you again! Please contact us with any questions you might have or for more information about coaching and camps. And hope refills my weakened will as I recall that scene. For just the thought of that short race rejuvenates my being. A children’s race, young boys, young men; now I remember well. Excitement, sure, but also fear; it wasn’t hard to tell. Or tie for first, if not that, at least take second place. And each boy hoped to show his dad that he would be the one. To win, to be the hero there, was each boy’s desire. The little boy who thought to win lost his step and slipped. And ‘mid the laughter of the crowd, he fell flat on his face. So, down he fell, and with him, hope. He couldn’t win it now. Embarrassed, sad, he only wished he’d disappear somehow. He quickly rose, no damage done, behind a bit, that’s all. And ran with all his mind and might to makeup for the fall. He wished he had quit before with only one disgrace. But, in the laughing crowd he searched and found his father’s face. But trying so hard to catch the lead, he slipped and fell again. Defeat! He lay there silently, a tear dropped from his eye. The will to rise had disappeared, all hope had fled away. So far behind, so error-prone, a loser all the way. But, then he thought about his dad, who soon he’d have to face. “Get up,” an echo sounded low, “Get up and take your place. He resolved that win or lose, at least he wouldn’t quit. So far behind the others now, the most he’d ever been. Still, he gave it all he had, and ran as though to win. Three times he fallen, stumbling, three times he rose again. Head high and proud and happy; no falling, no disgrace. The memory of that little boy helps me in my race. Warm up with 5 minutes easy spin followed by 5 minutes at slightly higher resistance. Then 10 minutes easy with 10 second fast pedals at the top of each minute. 5 X 3:00 climbs in the saddle. Highest resistance 60-70 RPM. Recover 2:00 between climbs. 20 seconds all out sprint followed immediately by 10 second recovery, 8 times. A total of 4 minutes.